I’ve always been an MS Word girl when it comes to writing. As long as I’ve had Word, I’ve never needed another program. It’s easy to use, and after years of working with it, I feel an odd sort of attachment to it. As the saying goes, why fix what isn’t broken? But I kept hearing people rave about it, and curiosity got the best of me. After winning NaNoWriMo this past September, I received a coupon code for half off the famed writing software Scrivener. I had heard nothing but good things about it. Although skeptical of its success, I purchased it immediately. The program, at first glance, looks complicated. There are folders, files, templates, and so much more. I wasn’t sure where to get started. Luckily, Scrivener understands the learning curve. Upon opening the software, you can utilize the project wizard, which will set you up to write a novel, short story, or what have you. As a self-proclaimed organization junkie, I love Scrivener. 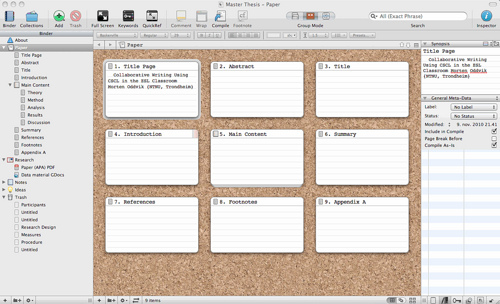 I can use the cork board function to outline my whole novel at once. The character and setting sketches help me get a feel for the world of the story. Similarly, I can click between scenes and chapters and move things around if I’m unhappy with the order. Scrivener is awesome. I wouldn’t go so far as to say it’s necessary when writing a novel (because it isn’t), but it certainly helps speed the process along. I understand if you’re committed to Microsoft Word. That is understandable. But Word’s organization capabilities are pretty limited. If you’re anything like me, you should at least do the free trial. After all, you haven’t got anything to lose. What do you think of Scrivener? How do you use it? What other writing programs would you like to see reviewed?